I wouldn’t keep my dogs there! It’s a junkyard and dump site. Did not stay, just drove through. The site a large and easy to get into. They have a well stocked store and a decent pool. There is a flea market right next door. They have a large conference center building. We did not go in, but it looks like it will accommodate a large group. Easy on and off of I-75. Nice facilities with clean bathrooms. Pull through site was very easy to set up and take down. Friendly staff were helpful and really knowledgeable. We went camping at Chehaw Park July 13th – 15th of 2018. All the sites were grassy and pretty much level with picnic tables, really tall pine trees, 20/30/50 amp service, water and some with sewer. The Park as a hole is very nice, asphalt roads and parking lots, except for campground it has dirt/gravel roads, dirt bike track, R/C track, small water park and pavilions Call to reserve a site and make sure you get the gate code. This is a good place to take the family. Quiet. Off the beaten path. Near Douglass, Ga. Abour 30 minutes to Broxton Rocks. Not much to do in town but this is a great park. Very nice at Christmas. The camp staff was very friendly and helpful but the obnoxious camp post put a damper on our stay. I hope they fix this. there were not a lot trees but lots of trails nearby. Nice bathhouse. While Sugar Mill is titled as an RV Park, they accommodate tent camping as well. There is a general store in the office for any forgotten items, and electrical/water hookups if desired. The lady who owns and runs the place is very personable and sweet, and the bubbling stream behind our campsite was lovely and made this place even prettier. KOA in Cordele, Ga is another example of what I don’t usually visit while going camping. I purchased a membership recently to give KOA a fair shake , they do sponsor a camp for kids and offer deals certain months , plus some people like their WiFi while camping AND as a child my family journeyed from Ohio to California one summer in the 70’s and KOA was the thing back then ( no WIFi of course;) but plenty of swimming pools, putt putt golf and evening entertainment. That being said…..every KOA I’ve visited so far is an “island”, not connected to any outside recreational areas , it may be different in other areas. In Cordele, you had the campground and that was it. You have to drive somewhere else if you wanted to hike, kayak, mountain bike, etc. Don’t get me wrong, this is my preference in camping, my sister in law loves KOA’s, so it all goes back to what you want. The facilities were mostly well maintained but the grass was a little high in the tent area, may have just been in between maintenance. There was a small, fenced dog area and poo bags provided throughout the campground in yellow mail boxes. This was a long skinny campground with the pool located in front of the office , the dump station to the right of the road in and the shower facility behind the office. There was also a kitchen with an outside grill available. We got in after dark and the after hours sign in and site assignment was a little confusing or I was just tired. When I followed the map I had a difficult time following the overgrown road to the tent site and was the only one there. Not a lot of light and not very good boundary markings to my site but no worries I was alone and could have parked longways had I wanted to. It was quiet and we slept well enough. There was electric, a fire ring and picnic table at each site plus plenty of sand, gnats (bring your bug stuff) and grass. Once again, this all goes back to preference, it is a nice enough KOA but same as the other one I would not want to visit when it’s full, it would be crowded with little privacy. We stopped here overnight on our way to Stone Mountain. great, big sites. Lots of room for kids to run around and play. immaculate facilities. unfortunately at the time of year we were there there were lots of gnats. I didn’t care for this campground. Thank goodness we had a site near the front and a larger site. The sites were stacked in top of each other. I paid extra for a deluxe site and there wasn’t anything deluxe about it. The outdoor patio furniture was rusted and falling apart. The fire ring was rusted with holes in it. The bathrooms were really old and dirty. The staff was friendly and helpful. This beautiful campgrounds main attraction is the water. In the big lake it offers boating tubing skiing. You can also take the river run and boat or paddle upstream. It is an easy paddle with plenty of places to get out. On a creek with a bar and live music. The sites are not pull through but they are on a creek. It is a small campground. There is a store with propane and ice. The bar opens each evening with occasional live music. We have gone to this campground a couple of times now and every time we go it has been a great visit. We love buying carrots to feed all the farm animals and if you want some good exercise rent one of the pedal boats. very friendly and helpful camp host, Steve. had full hook ups near restrooms. extremely clean, quiet, and definitely going back! I frequently drive from southwest Florida to Atlanta. When I’m towing my Casita I stop for the night at Reed Bingham State Park, about the halfway point. I never need a reservation & I get to choose my own campsite which is ALWAYS a pull through. This is a small campground with a small store and a small lake. It’s lovely and clean but the sites are open with some shade trees. Restrooms & showers are clean and that’s all I require other than electricity and water for a quick overnight stay. I wouldn’t stay here as a destination although it’s very peaceful and near Axel, GA, but it’s terrific and handy and affordable as an overnight stop. fantastic park! bathrooms are always spotless. nice paved roadway. gravel sites all of them pull through. large private sites. the farm is aleays fun for the kids. great place for bike rides too. Nice and clean full hookups campsite with picnic table and fire ring. Park rangers and camp host are really nice and helpful. 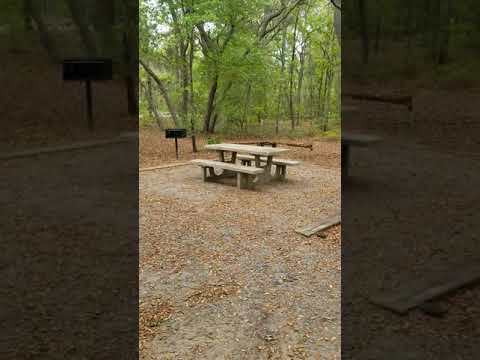 This park has a lot to do from different programs/ activities by the rangers for all the family, hiking and bike trails, swimming area, boat ramp, great for fishing, playground and putt putt golf. Campground bathroom is really clean and has laundry too. Reed Bingham State Park is located in Adel, GA. It has about 1600 acres including a 375 acre lake with many activities surrounding it. There is a dam with fishing as well as boating, swim beach and and island for camping. Off the lake are 2 camping loops with just under 50 sites. Ranging from water/electric only to full hook-ups. Prices run between $28 and $38 per night. There is also primitive group camping and Eagle Island camping in the lake if you wish to paddle over. Our family stayed here in December 2016 with friends. We were lucky enough to get 2 standard sites side by side so we could create a cozy awning to awning camp area for our families. The bathrooms and laundry were nearby (1 in each loop). There was a large grassy area in the middle of the loop for the kids to play soccer, set up the slack-line, etc.They also enjoyed the playground, climbing tree and mini-golf nearby. We went on some short hikes in the park. There are 7 walking and biking multi-use trails that are all under 1 mile. You can connect them together for a much longer hike. Overall, this was a great family friendly campground. Stayed one night on the way to Florida. Came in late and left early, so didn't get to enjoy a lot that they had to offer. They have a turtle habitat and nice lake area. Hope to visit again. Had a nice pull through site right by the bathhouse, which was very clean. Gorgeous Spanish Moss. We had a nice overnight stay coming back from florida. We love to stay anyplace with a lake or river so this was a pretty park with a nice lake. Not crowded which we love and pet friendly which is important to us. Plenty of bicycling and relaxing to go around! Watch out for the gopher tortoises! They hiss!